Off of a tip from an old friend, he moves into Thunder Bay, Ontario (Canada represent!) 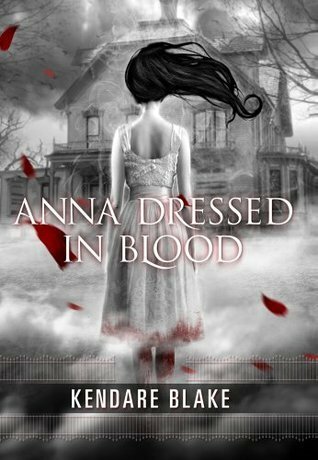 to hunt a ghost named Anna Dressed in Blood. There, he meets and makes new friends, enemies ... and possibly a supernatural girlfriend? I peek over the back of the couch and there she is, my goddess of death, her hair snaking out in a great black cloud, her teeth grinding hard enough to make living gums bleed. Alright, Cas, whatever floats your boat. One of my biggest qualms of this novel is the plot holes. There are some huge gaps in the story that left some pretty important concepts unexplained. Like, I don't understand the attraction between Cas and Anna, at all. It was basically insta-love, but the author tried to make it into much more, which made it even more confusing. There's some connection between the two, but it's not well explained. Then there's some big thing relating to the monster that killed Cas's dad, but I don't quite understand what happened with that either. I don't know, maybe it's just me. Other than that, I do like the characters, and they made the story more enjoyable. The cliche is there; Carmel, the popular girl who turns out to be down-to-Earth; Thomas, the social outcast that is actually quite fun to be around; dumb jocks who mess everything up. But the dialogue is witty and character relations were fun to follow as they developed. Cas is not my favourite protagonist, but the rest of the cast made up for it. The writing is decent; lots of creepy lines and humorous ones as well. I’ve been Obeahed by an Obeahman? Is this like how the Smurfs say they smurfing smurfed all the time? Overall, this was a 3.5 stars for me. I would recommend it if you're looking for some soft horror and a not-so-serious plot. While it won't be of much priority, I kind of still want to read the second book just to see what will become of the characters.